7 p.m. - Speak at Vancouver's MAWO ~ Mobilization Against War & Occupation's evening lecture by Professor Michel Chossudovsky "US Hands Off North Korea! North Korea and the Threat of Nuclear War"
Hosted by NorCal Friends of Sabeel and Codepink Women for Peace, Golden Gate Chapter GoingShare clock Saturday, February 24 at 7:30 PM - 9 PM PST pin Redwood Gardens, 2951 Derby St, Berkeley envelope Invited by Cynthia Papermaster About Discussion 2 Going � 5 InterestedSee All Cynthia is going Share Details Join us for an update on deteriorating conditions in Gaza, the BDS campaign, Israel's ban on Codepink, JVP and other groups, and plans for the Summer 2018 Gaza Freedom Flotilla to challenge the Israeli naval blockade of Gaza. Refreshments, book signing, music. Donations for the Flotilla: https://womensboatgaza-nonviolenceinternational.nationbuilder.com/ Co-sponsored by Norcal Friends of Sabeel, others. 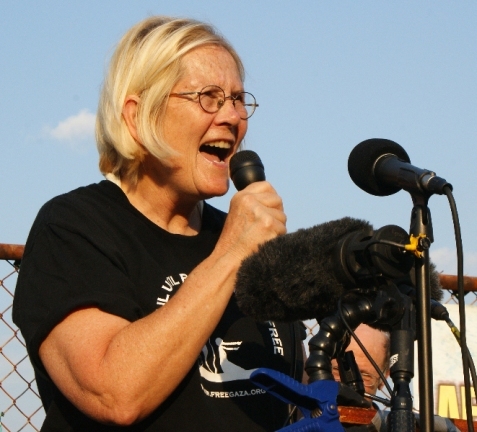 Ann Wright is a 29-year US Army/Army Reserves veteran, a retired United States Army colonel and retired U.S. State Department official, known for her outspoken opposition to the Iraq War. She received the State Department Award for Heroism in 1997, after helping to evacuate several thousand people during the civil war in Sierra Leone. She is most noted for having been one of three State Department officials to publicly resign in direct protest of the 2003 Invasion of Iraq. Wright was also a passenger on the Challenger 1, which along with the Mavi Marmara, was part of the Gaza flotilla. She served in Nicaragua, Grenada, Somalia, Uzbekistan, Kyrgyzstan, Sierra Leone, Micronesia and Mongolia. She is the co-author of the book "Dissent: Voices of Conscience." Causes Share In Messenger To:	Choose friends Add a message... Featuring NorCal Friends of Sabeel Community Organization NorCal chapter of Friends of Sabeel, a non-profit, ecumenical organization seeking justice and peace in the Holy Land through non-violence and education. Codepink Women for Peace, Golden Gate Chapter Community CODEPINK is a women-led grassroots group working to end U.S. wars, support peace, justice and human rights, and redirect our tax $ to human needs. https://www.veteransforpeace.org/pressroom/news/2017/09/15/2018-vfp-vietnam-trip 50-year look back at 1968 - the Tet Offensive, Khe Sanh, My Lai - as we travel through Viet Nam, north to south. For the seventh year, Viet Nam's Hoa Binh (Peace) Chapter 160 of Veterans For Peace (VFP) will host a two-week insider tour of a former war-torn country that is now a nation of peace and beauty - Viet Nam. The Human Rights Academy is sponsored by the Hawaii Institute for Human Rights, Amnesty International, Pacific Asia Affairs Council, The Good Group, and the United Nations Association. Col. Ann Wright who was with the Gaza flotilla in Sicily and Alex McDonald who was crew member on one of the boats as it was harassed by police in Paris will do a presentation on the story of the 4 boats, their stops, the reception in different ports and their crews. Presentation will start at 1pm at Live Oak Friends Meeting. Bring your friends and families for an interesting story of activism for human rights and the Right To A Just Future For Palestine. The closing date for the registration and reception of abstracts for the Seminar will be Friday, June 29, 2018.
https://uscpr.org/conference2018/ he program includes sessions such as Resilience Across Movements, Updates from Palestine, Intersectional Feminism and Gender Justice, Palestine in US Politics, and Global Struggles for Collective Liberation. Confirmed speakers include journalists Mariam Barghouti and Marc Lamont Hill, human rights lawyers Noura Erakat and Hassan Jabareen, and Indigenous rights activists Waziyatawin and Coya White Hat-Artichoker. Dozens of workshops will teach us about the militarization of the US/Mexico border, how to harness constituent power to make change in Congress, hold a direct action, and more. 50TH ANNIVERSARY EVENTS PANEL DISCUSSION Saturday, October 13, 7 to 9 pm Presidio Officers Club 50 Moraga Ave, San Francisco (free ticket registration) ON SITE COMMEMORATION Sunday, October 14, 1 to 3 pm Fort Scott Stockade 1213 Ralston (near Storey), San Francisco During the Vietnam War era, the Presidio Stockade was a military prison notorious for its poor conditions and overcrowding with many troops imprisoned for refusing to fight in the Vietnam War. When Richard Bunch, a mentally disturbed prisoner, was shot and killed on October 11th, 1968, Presidio inmates began organizing. Three days later, 27 Stockade prisoners broke formation and walked over to a corner of the lawn, where they read a list of grievances about their prison conditions and the larger war effort and sang We Shall Overcome. The prisoners were charged and tried for "mutiny," and several got 14 to 16 years of confinement. Meanwhile, disillusionment about the Vietnam War continued to grow inside and outside of the military. Womens March on the Pentagon to Confront the Bi-partisan War Machine On October 21, 1967, 50,000 people marched on the Pentagon in opposition to the escalation of US imperialist aggression in Vietnam. An anti-war rally was held at West Potomac park near the Lincoln Memorial where 70,000 people had gathered for a concert by musician and peace activist Phil Ochs. Both groups joined together and marched; this action was to be known as the March on the Pentagon. During 1967 there were numerous anti-war marches across the nation in all major cities including New York, Boston, San Francisco and Washington, DC. tackle the series of geopolitical and civilizational, cultural, and epistemological ruptures taking place that simply cannot be understood by the conventional wisdom of the hackneyed and out-of-date analytical toolbox of the heyday of the Cold War years of the 20th century. The theories and explanatory models of that time, centering on classical modernization theory and International Relations theory, and so on - seem insufficiently robust, if not downright discredited, in explaining the multiple, cascading crises that afflict humanity today. The attempt of this conference is two-fold; our first inaugural conference at NDU (March 2017) collected a number of principally Muslim intellectuals addressing issues impinging directly on the Islamic world. This conference is more ambitious in the discourse that it would like to generate, and policy prescriptions that could potentially emerge on the global level and their meaning for the well-being of Pakistan, other parts of the global South, and the bulk of humanity that is attempting to forge a counter-hegemony. https://www.ethecon.org/en/505 Since 2006 the foundation Ethecon - Ethics & Economy awards two international prizes: The Blue Planet Award and the Black Planet Award. The two awards are the outcome of a cooperation between the world-famous ZERO artist Otto Piene and the ethecon foundation. At the same time the awards are also an expression of the cooperation between the great art photographer atharina Mayer that exists since 2010. The aim of the Blue Planet Project initiated by the Ethecon - Ethics & Economy foundation is to seek and find annual award winners. In addition, an annual presentation of the award takes place during an official ceremony which is held under a new theme every year in the context of our responsibility to sustain a liveable world. It is inspired and held in cooperation with the ZERO artist Otto Piene.